Not simple retellings of the tried and true stories of buccaneers on the high seas, this book focuses on how pirating tactics of the 1500s through 1800s to give the reader a view of how pirates functioned through history. Readers will follow eighteen of the most famous pirates in detail as they raid major ships and pillage coastal villages. Readers will learn how the pirates approached such invasions and how they managed to elude authorities and sometimes whole navies. With archival images gathered from around the world. 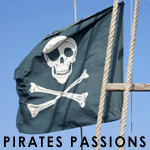 Each chapter is a stand-alone story about a famous buccaneer and follows them moment by moment on a specific attack as an example of their greater techniques and tactics for plundering. Readers will follow the characters in live action and trace their movements in real time; a recreation of the action based on the historic information available.